An excellent British First Day Cover from 1974 featuring the 40th Anniversary of the First Regular British Inland Airmail Service . 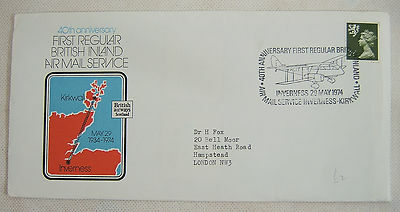 The envelope was issued in Inverness of the 29th. May 1974. The original flight was undertaken by the DH84 Dragon G-ACIT (although Highland Airways operated 5 of them). The anniversary flight was undertaken by Vickers Viscount V802 under the auspices of British Airways Scotland. The condition of the envelope is very good and it has not been sealed down. It also contains the original little booklet which came with it.